Reclaimed Pallet Deck Flooring – Pallet Outdoor!! 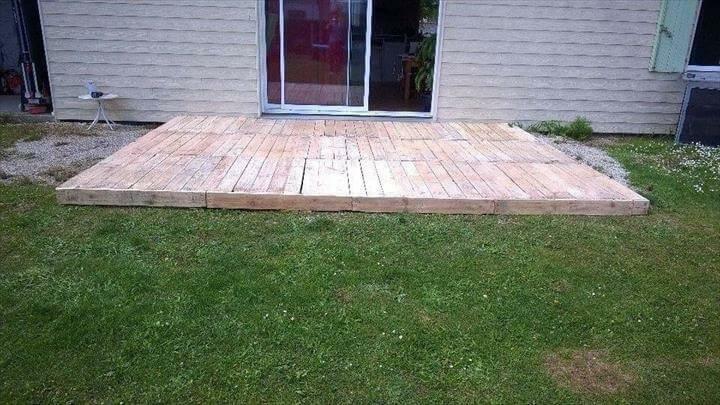 Home deck is considered always a convenient and ideal place for sitting! If you are also having a deck space but it looks dull and boring then we have some budget-friendly suggestions here for you that will surely be helpful to turn your home deck into a stimulating focal point! This DIY pallet deck flooring idea for home will really be awesome for your garden landscaping and home deck renovation! The material you only need to get this project done instantly, is pallet wood! 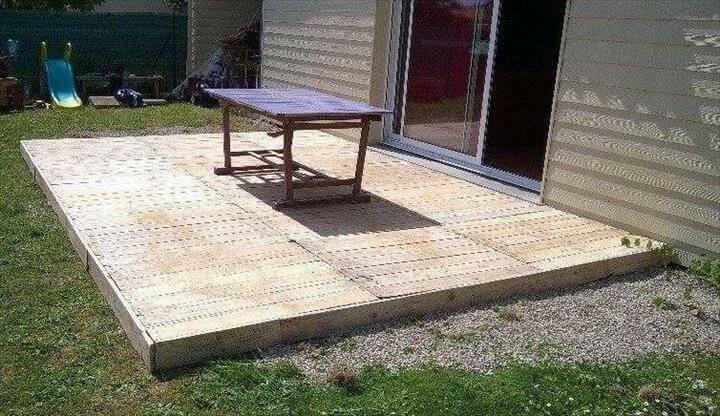 No need here to disassemble the pallets, just arrange the whole pallets side to side to get an enticing wooden floor that will specify your deck space for seating and guest entertainments! If you don’t want to go extravagant but need also some sofas and benches to organize this renovated area for seating then you can simply check our recently added pallet patio furniture project that would be certain to make you get with your favorite seating plan! 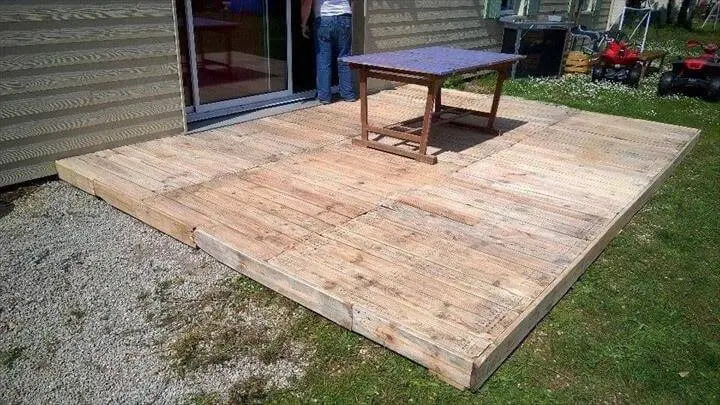 There are various extra creative uses of feasible rectangular pallet shapes, just floor them up to get a wooden flooring anywhere in or out of your home just like done in this case of deck remodeling and renovation! Simply layer the glue inside to hold the installed pallet tightly in place! If your pallets are having some spacing between the wooden slats and just fill them up with some already removed pallet planks to get nice units for plane wooden floor! This raised pallet deck flooring can stay much longer due to hardwood nature of pallets, a coat of varnish or wooden sealant can result into better wooden appeal! Pallet sofa set designs for your home deck made with pallets, Sectional, Single SOFA, double seater, also with coffee table.